Child 31 is an inspirational short film about the work of Mary’s Meals. It follows our founder and CEO Magnus MacFarlane-Barrow as he travels to our school feeding projects in Malawi, India and Kenya. Watch, love, share … and help us reach the next child waiting for Mary’s Meals. 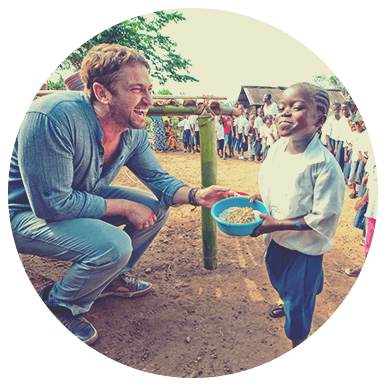 Hollywood actor Gerard Butler is among a host of celebrities and well-known personalities giving their support to Child 31. He also appears in the film and has visited our project in Liberia. Find out what Gerard says about his experiences with Mary’s Meals and who else supports Child 31. You can help bring our work to new hearts and minds by sharing Child 31 with others. To order your copy, please contact us online. Arranging a showing is straightforward and it’s a great way to generate interest in fundraising work. Get in touch to find out more.